Chairman, ADF Business & Investment Committee. 1. Remember that I was very reluctant to attend that meeting. It was in difference to your plea and that of other ADF leaders that I agreed to spend three extra days in the East just to attend the meeting. 3. In his opening speech, he advised against Ndigbo backing any Presidential candidate because Ndigbo belong to various political parties. 4. However, nearly everybody who spoke except one, passionately made their case, namely, that already there was no doubt where majority of Ndigbo want to go. They asserted that majority of Ndigbo have up their mind whom to support if the election holds. 5. They all passionately argued that OhanaezeNdigbo must endorse the Atiku/Obi Ticket in accordance with the yearning of majority of Ndigbo. They gave various reasons for their position. According to them, the process of ethnic and religious cleansing which is currently on break because of the election will resume with all fury if Buhari wins the election. This will not be the case if Atiku/Obi ticket wins. The pressure on Igbo business men as well as the inordinate determination to squeeze out the economic life-wire of the Igbo nation in accordance with the revelation of Kunle, willproceed to its logical conclusion. Not only is Atiku a more liberal Fulani and a liberal Moslem like his mentor, the late General ShehuYar’dua, but Peter Obi is a man well-known for his acute sense of the developmental needs of Alaigbo, etc, etc. In short, there is obvious yard stick to make a choice out of the two leading tickets. 4. Prof ChigozieOgbu Vice Chancellor of Ebonyi State University and Vice Chairman of Ohanaeze Ndigbo, Ebonyi State, etc, etc. I can only remember one lone voice arguing that Ndigbo should not take a position. If you add that of the Chairman Prof. Soludo, you have just two voices asking Ohanaeze not to take a position. The urgency of a formal declaration by Ohanaeze of the position of Ndigbo was emphasized by most speakers. Prof. Soludo’s idea of summoning two more meetings in Abuja and Lagos for those who could not attend the meeting of the Strategy Committee in Enugu was considered as most uncalled for and as a deliberate ploy to rubbish the Igbo nation. .
Sam, I expected that after the meeting. Prof. Soludo would have immediately transmitted the decision of the Strategy Committee to the leadership of Ohanaeze because of the urgency of the situation. Dear Sam, a few pertinent questions. 1. On December 8, there was a meeting of Elders and Stakeholders of Alaigbo during when a unanimously endorsement of the Atiku/Obi ticket was taken. 2. Since that time, there is no day that we do not read in the papers or hear from the TV and Radio that Ohanaeze have not endorsed the Atiku/Obi ticket. Who is Ohanaeze outside these eminent leaders, traditional, religious, intellectual, etc. 3. A delegation of a so-called Ohanaeze Youth Wing has visited President Buhari, and neither they nor their sponsors have thought it fit for them to also visit the Atiku who is running with our son as his Vice Presidential candidate. 4. Can you see why De Sam Mbakwe and others held a derisive attitude to Ohanaeze as an NPN-outfit, meaning a creation of the Caliphate. 5. Is there any other form of humiliation of Ndigbo than what is playing out now under the watch of the present leadership of Ohanaeze? 6. See what they are doing to a nation of over 70 million people in Nigeria alone! 7. See what they are doing to the entire Igbo race!! 8. We are aware that there is grand plan to rig the election in favour of the incumbent. 9. That should not deter us from doing all that is within our power to support the ticket we have endorsed, Heaven helps those who help themselves. Man proposes God disposes. 10. Ndigbonasionadinma ma ikukukuo, kahuikeokuko. Finally Sam, let me restate the position of ADF with respect to the forthcoming elections, namely, that the fate of Ndigbo and their struggle for political and economic emancipation will not be determined by the outcome of this election. 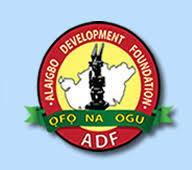 However, ADF has endorsed the Atiku/Obi ticket with clearly stated reasons. We have also appealed to our compatriots who hold a contrary view on our participation in the forthcoming elections to bear with us and let us take part in the elections while the struggle continues.